This walk: 2011-8-17. Venford Reservoir, auxiliary overflow, notice, triple mortar stone, nest boxes, rosebay willowherb, thistle, longhouse ruins, Venford Brook, rainfall notice, ducks, tree roots, pine cone, RD/H boundary stones, White Wood, Sharp Tor, Mel Tor, Bench Tor, River Dart, PUDC, 4th Anniversary cake! The new auxiliary overflow at Venford Reservoir, designed to deal with a 100-year storm event. Notice at the entrance to the round-reservoir walk, the reservoir opened in 26 June 1907. An unusual triple mortar stone, which is unusual partly because there is no known history of tin ore-crushing in this area. View to the southern end, opposite end to the dam. The thistle's leaves (excl. the rhododendron on the right). View to the north (dam) end of the reservoir. Four ducks in a row. Nearing the dam, looking across at the car park - where the Pimm's and pasties were! Pine tree, with leaves (needles) in pairs. Besides the Scots pine (which this probably is), the Collins Complete Guide to British Trees includes Red Pine, Japanese Red Pine, Japanese Black Pine, Beach and Lodgepole Pines, Bosnian Pine, Austrian Pine, Corsican Pine, Crimean Pine, Mountain Pine, Stone Pine, Maritime Pine, Aleppo Pine, Calabrian Pine, Monterey Pine, Ponderosa Pine (Western Yellow Pine), Arolla Pine, Bhutan Pine, Weymouth Pine, Macedonian Pine and Rocky Mountain Bristlecone Pine - all found in Britain! The walk above Venford Brook, along the line of a large pipeline (water main). A general view inside White Wood, on the climb up to Bench Tor. From near Bench Tor, looking down at the Double Dart in the valley below. Sharp Tor, SX 686 729, elevation 380 metres (1246 feet). Mel Tor, SX 693 726, elevation 346 metres (1135 feet). A mixture of Bell Heather and Common Ling (the lighter coloured flowers). Damp Moor Strollers with Sharp Tor behind. Another reservoir boundary stone back at the car park. On the reverse face, PUDC - Paignton Urban District Council. The road and reservoir can be seen in the background, on the left. In disguise: Maida Vale, or Maid of the Veil; by the way - Happy Birthday! 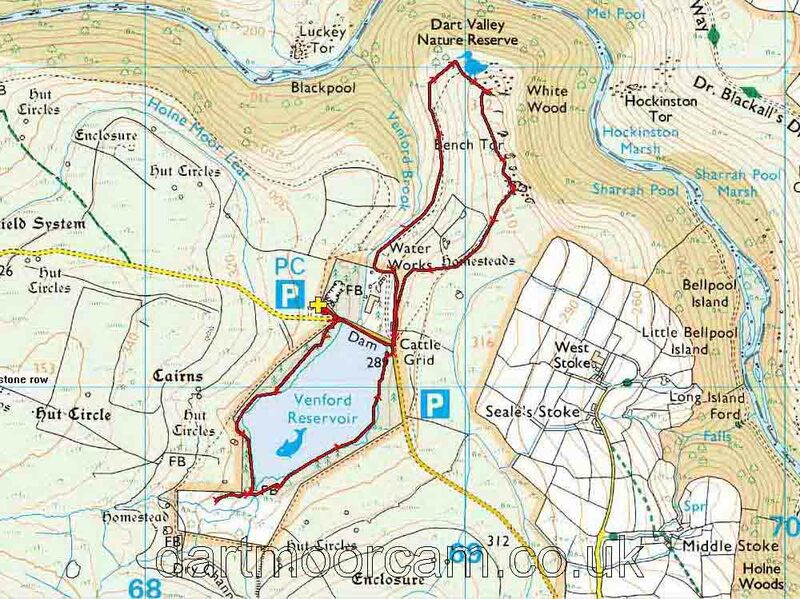 This walk was reached by driving east from Two Bridges on the Ashburton road, turning right just before Dartmeet to Hexworthy and driving past Combestone Tor to the reservoir car park, marked on the map by the P symbol and the yellow cross. Distance - 4.74 km / 2.95 miles.